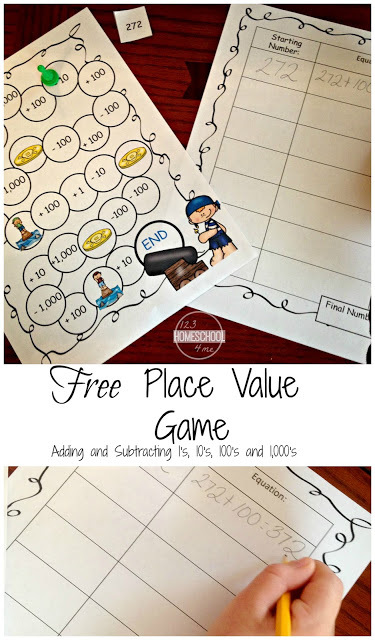 Kids will have fun practicing adding and subtracting to different place values with this fun and FREE Pirate Place Value Game. Have you ever been around a person who can whip out an answers to math questions quicker than you can pick up a pencil? Maybe that accurately describes you, or maybe you are what I once was like and can only solve a math problem with a piece of paper and fingers…though a calculator was my preference. Things have changed though, and it is because of one concept I learned as a teacher. Do you know what that one trait is that helps people be successful at mental math? Simple as that. If a child or an adult has a good understanding of place value, they are more likely to be able to do mental math. They will probably be more efficient at addition, subtraction, multiplication, and division too. Knowing how important this concept is, place value has been our focus over the past few weeks. Though there has been a lot of different activities, we enjoyed playing a game where the children raced to build equations that showed expanded form. We also loved the color by number game. Each coloring page has a spinner with place value clues, and the boys could color in parts of the picture that matched the clue. First person to get the whole picture colored was the winner. I can tell that my first graders is beginning to develop an understanding of place value, and so we are ready for a new game to stretch him some more. This game is designed to help first through fourth graders mentally add or subtract 10, 100, or 1,000 to a given number. What is included in Place Value Pirate Game? First one works on adding and subtracting 1 and 10. The second one focuses on adding and subtracting 1, 10, and 100. 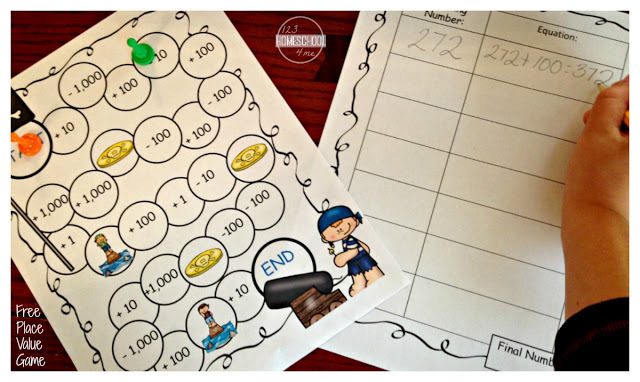 The third game board allows children to practice adding and subtracting 1, 10, 100, and 1,000. These cards are drawn at the beginning of the game. They are simply a starting place and gives the students the number that they will add or subtract from on the first play. 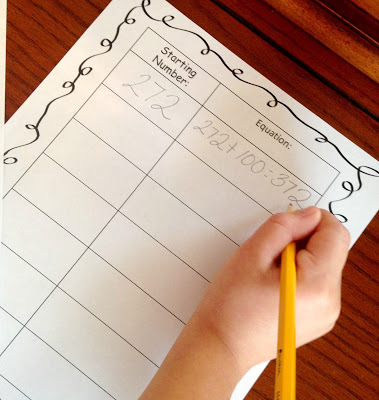 To begin, players draw a starting number and record it on their record sheet. Then players take turn rolling the die and moving their marker up that many spaces. After each roll, players use the starting number and number they landed on to create an equation. This is recorded on their record sheet. The answer is the new starting number, and is written on the next line. If a player lands on a gold coin they may roll again and move forward. If the player lands on a pirate walking the plank, they roll again and move that many spaces backward. When both players have reached the end, the player with the highest total wins! Place value is such an important concept and it deserves quality time. Quality time, doesn’t have to be pouring over worksheets though. 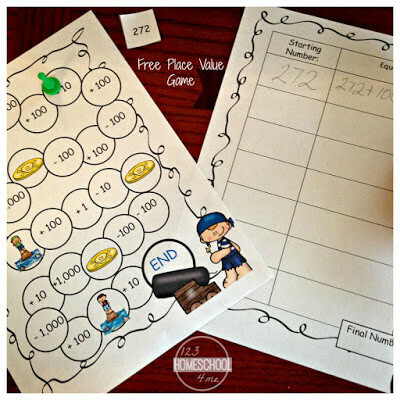 Enjoy this free, fun game as one way to work on place value, and then check out some of these other great ideas to help make place value a priority in your classroom.